I am sitting here writing this blog and as I reflect on my own work, I am aware that there are aspects of the job itself that perfectly fit me. I can be independent, work at my own driven pace, and have the right amount of interpersonal interaction. What is required of me to be successful is perfect because that is who I am. When we are successful, we become motivated in an exponential way. Employees don’t “get” the job (or their organization). They struggle really knowing it in and out. They may know how to do the skills of a job at surface level, but struggle knowing how to maneuver around obstacles (namely people obstacles) and see how their job fits within the overall structure of the organization. They don’t know how to be “culture smart”. Employees who “get it” not only master the skills of a job to the point they can do it in their sleep, they actually advance the job by finding new and creative ways to accomplish the their tasks more effectively and efficiently. 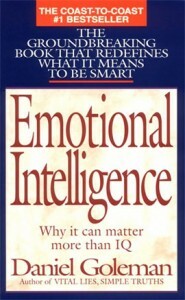 This is the crux of Emotional Intelligence. Emotional Intelligence is a skill that can be learned and it becomes the differentiator between high- and low-performing employees. Employees honestly don’t understand what the job does for our society and culture. We may not have outright thought about it but, at the core, improving people’s lives and our own lives is what drives us. We all work in some way to help people, to help society, to “make the world a better place.” To prove it, think through other jobs. How do you feel about them? You may not like the job because of what you would have to do or because it really doesn’t interest you. It’s not that the job is bad it’s just not . . . well, you. If employees can’t make that link, then the job becomes, well, just a job to pay the bills. When an employee sees the social responsibility side of their job, it’s almost as if they now have the “Iron Man” core, e.g. an energy source of purpose and calling. You know it when you see it, you know it when you don’t. Employees do not “love” the people they work with.. If you see an employee’s productivity fluctuating, consider whether the employee “fits” your team? Do they operate, think, and work like the rest of your team? More importantly, how does the employee get along with their supervisor? The relationship with one’s supervisor is the number one factor in determining an employee’s job satisfaction and organizational commitment. If there are relational struggles between the employee and her or his supervisor, it doesn’t mean it’s the employees fault. The supervisor may lack the competencies or the emotional intelligence needed to effectively manage and lead people. In a study of two million employees at seven hundred companies, Zipkin (2000) reported that the amount of an employee’s productivity and the length of employment are directly related to the health of the relationship with his or her direct supervisor. The DNA of an organization’s personality is formed out of the people within the organization, mainly its leaders. To end on a positive note, if all of those pieces fit, it’s a beautiful masterpiece. If all of those pieces fit for your employees, they will love their jobs. Emotions will be high (in a good way) and, as a result, will be more productive. Part of being emotionally intelligent is that you help your employees find jobs that match them. You help them become self-aware on the principles above. You are emotionally intelligent as a manager or leader when you are “in-tune” with your team and can assess how each of them “gets” their job, understands what they’re doing for society and culture and enjoys their job. If productivity is fluctuating in your company, yet you feel you have the “best” people for the job, we can help develop an emotionally intelligent organization!